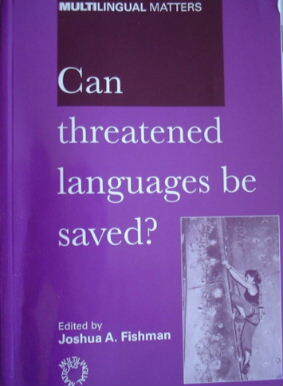 Can threatedned languages be saved? 总的看来，Fishman提出的RLS理论是一种基于社会语言学的语言规划理论，RLS的主要目的是通过一系列的措施和步骤将濒危的语言恢复到正常状态，由于语言问题涉及到社会、经济、心理、文化、政治等因素。RLS作为语言学家的一种理论，要让其真正起到作用，还须政治家的大力支持，否则难以奏效。计划语言的研究者们多年来通过对于计划语言的研究，已经就语言的社会化机理有了较为清楚的认识。如果，我们将Fishman的RLS中GIDS的步骤与著名计划语言学者 Detlev Blanke 的计划语言社会化步骤进行比较研究，就会发现计划语言的研究是可以为RLS 或濒危语言的拯救提供许多借鉴的。对于计划语言的发展感兴趣的读者，可以参阅由Klaus Schubert 主编的新作：Planned Languages: From Concept to Reality. (2001, Brussel: VLEKHO). This is an essential book for local language advocates, language policy specialists working for national and international bodies, and academic researchers and their students in sociolinguistics and applied linguistics who want to understand what is happening to the smaller languages of the world and how to assist them more effectively in their ongoing struggles for survival and recovery.